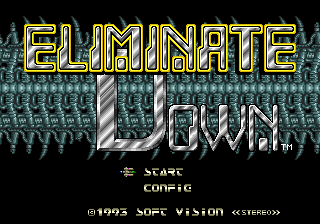 Eliminate Down (エリミネートダウン) is a 1993 shoot-'em-up by Aprinet and Soft Vision International and released for the Sega Mega Drive exclusively in Japan and South Korea. The game has become a very sought after collector's item and is therefore one of the most expensive Sega Mega Drive games. The game is similar to Toaplan's earlier Hellfire in that on top of being able to upgrade weapons as usual, there is a choice which direction the ship shoots by pressing or : straight ahead, in a spread shot pattern, and straight ahead both forward and backward. shoots. The Config menu grants access a target practice minigame where you use the D-pad to move a crosshair around a screen of tiles and pressing , , or to shoot a tile when it flips. Main article: Eliminate Down/Magazine articles.